Commercial summer shipping across havior in a way that helps industry in and Waves Reaching Polar Regions tries. In addition, it also received Nation- the North Pole may be possible by the Europe. The study was conducted as part (SWARP)”, which aims to use oceano- al Capability funding from the Natural end of the century, with the ? rst potential of the EU FP7 funded project “Ships graphic research to help European indus- Environmental Research Council. 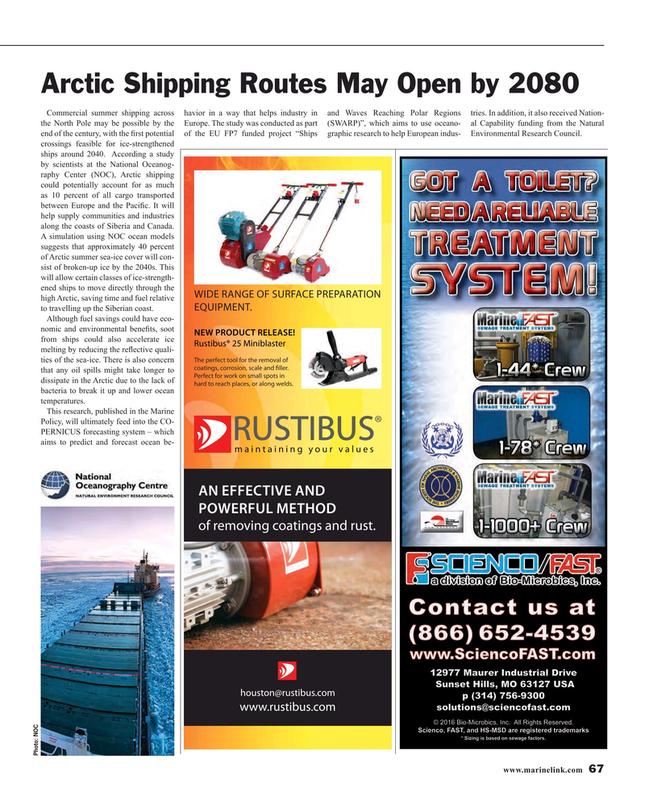 crossings feasible for ice-strengthened ships around 2040. According a study by scientists at the National Oceanog- raphy Center (NOC), Arctic shipping could potentially account for as much as 10 percent of all cargo transported between Europe and the Paci? c. It will help supply communities and industries along the coasts of Siberia and Canada. to travelling up the Siberian coast. Perfect for work on small spots in dissipate in the Arctic due to the lack of hard to reach places, or along welds. bacteria to break it up and lower ocean temperatures. POWERFUL METHOD of removing coatings and rust.